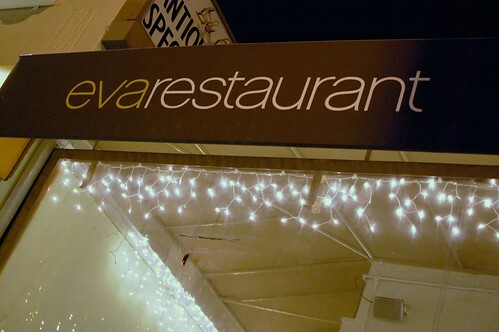 The Cruisers suggested that we go to Sunday Dinner at Eva earlier this year. 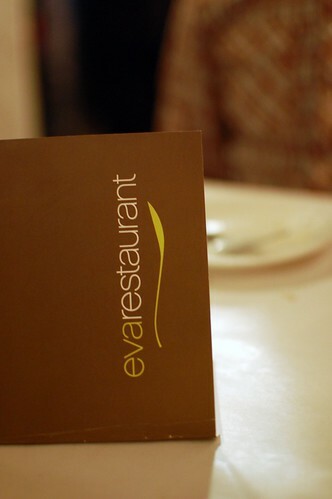 Eva Restaurant is named after Chef Mark Gold's grandmother, who inspired him with her warm home-cooked meals. 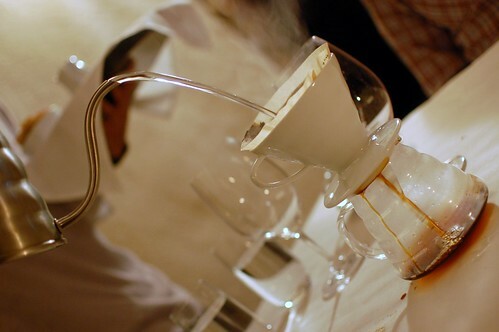 Sunday Dinner costs $35 per person and includes five family-style courses and wine. 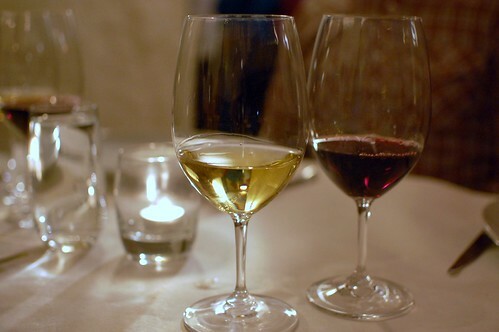 You have the option of red or white. 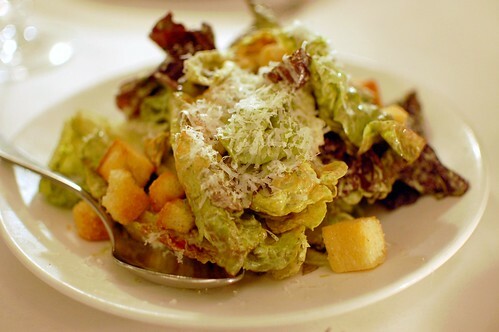 Little gem lettuce, green goddess dressing. A simple start. Good enough but not terribly interesting. Chicken harissa, peas, crème fraîche. Outstanding flavor and amazingly juicy. Very very good. 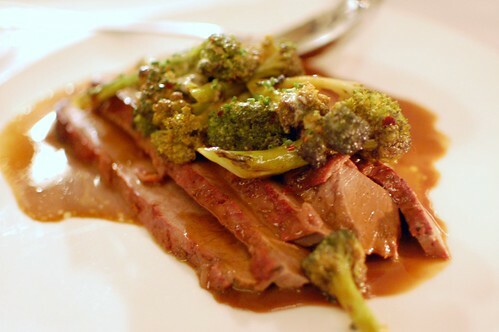 Braised brisket, natural jus, mustard, broccoli, garlic, lemon, olive oil. Fine but not impressive. Should have been more tender. Excellent and strong. 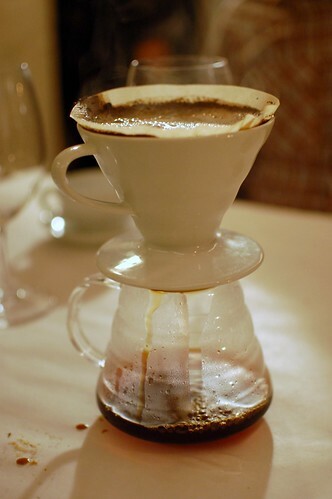 Don't miss this if you like coffee. 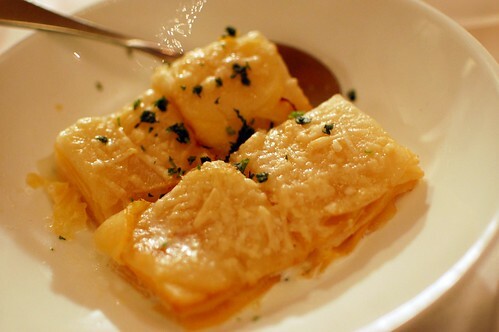 Enjoyable but, like most of the other dishes, not mind-blowingly so. The dishes above served all four of us. After we finished our tarts, we were still hungry. The meal we'd just devoured wasn't satisfying. Nothing was bad at all, but, aside from the chicken harissa and Kenyan coffee, nothing was really noteworthy. To be honest, I've had better meals prepared by Ms. Cruiser herself! We knew our night would end on a sweet note here. Mint chip ice cream sandwich ($4.50). Do you like macarons? Do you like mint chip ice cream? Do you like chocolate? If your answer is "yes" to all three questions, prepare for heaven. 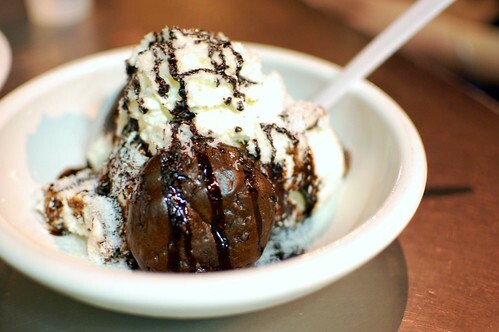 The Brownie -- double fudge brownie with chocolate and vanilla ice cream, hot fudge, pecans, whipped cream ($6.50). Too much chocolate for me and my allergies, but the rest of our crew liked it. 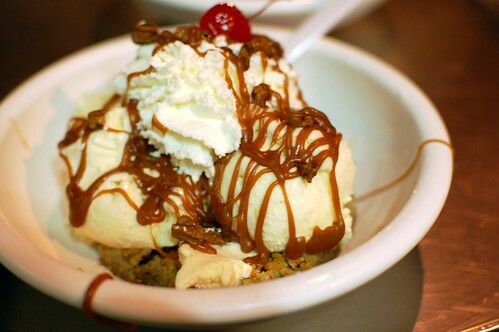 The Blondie -- white chocolate blondie with vanilla ice cream, butterscotch and pecan praline ($6.50). Loooooved this. My fave. I'm not allergic to white chocolate! This is what every allergic-to-chocolate girl needs when everybody else is eating chocolate. Like a warm hug for your esophagus. 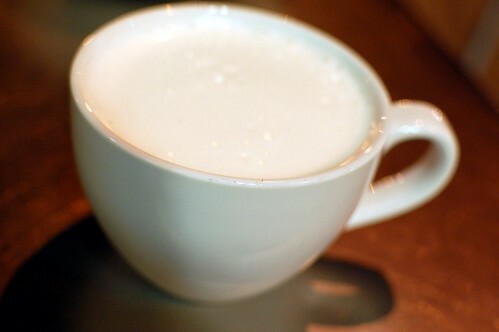 Any night with the Cruisers is a good night, but Milk helped make up for a somewhat lackluster meal at Eva. Yay for sugar. What a disappointment, the food looked so good. But even if it's tasty, I have to at least get full after a meal. Thank goodness for Milk afterwards. And I still haven't get a macorone. I always wonder if ordering a la carte is an improvement over the set menues sometimes. I wonder if your meal would have been more enjoyable if you could have picked anything off the menu. $35 per person sounds like a deal, but bummer that it wasn't fantastic. 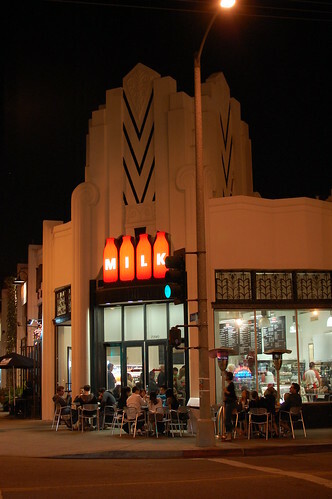 i can't think of a better way to end a meal than a trip to milk! that mint chip sandwich looks like heaven. Our portions were small bites of meh at Eva. Glad you managed to salvage the meal. I need that ice cream cookie sandwich. Thanks to you I'm now into macarons and I love mint chocolate chip ice cream. you make me want to give up kosher. Holy fuckballs I want to drive out to Milk just for dessert right this very second. Sad that the chicken dish is the most memorable plate. You are killing me with those Milk pictures!!!! Easter can't come soon enough. I had such high hopes for Eva when I started reading this post. :( Thank goodness Milk saved the evening! Thanks for the review and thoughts on Eva. It's been on my Try List for a while, but I think I'll move it down a few notches after your experience. This is the worst blog ever for a dieter to read. Ah, I've been meaning to visit Eva sometime! 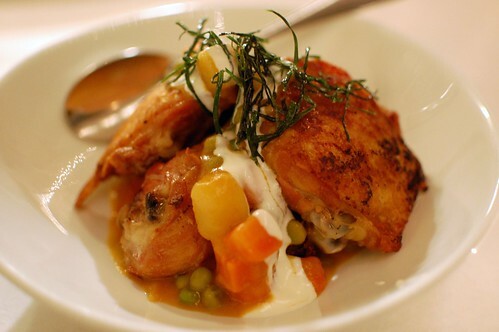 The Chicken harissa, peas, crème fraîche dish looks good. So does the gratin! But everything kind of seems like things I can make at home, too. Mediocre meals pain me. Even ones I only read about. 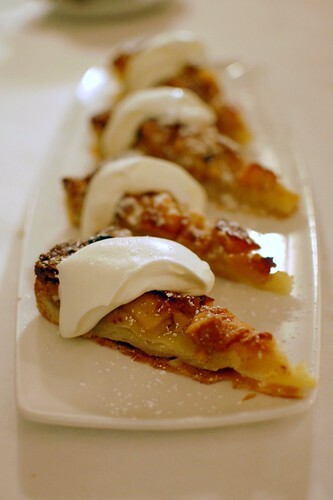 Mozza's Amaro Bar is still the best $35 deal in town! 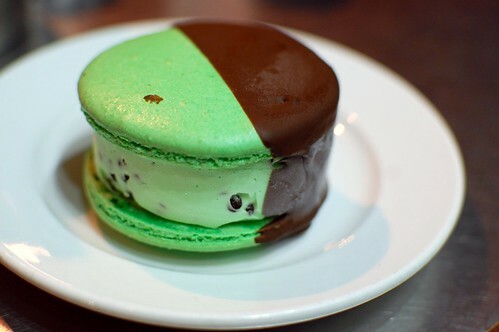 i need that minty macaroon heaven. That mint chip thing makes my mouth water. Yes please.